OAKLAND – Steve Kerr and the Warriors did something Thursday night that they’ve developed a reputation for doing. They flipped the script on tradition. The organization wanted to honor the life of Craig Sager, who died earlier in the day. That usually means a moment of silence. Not for the Warriors. 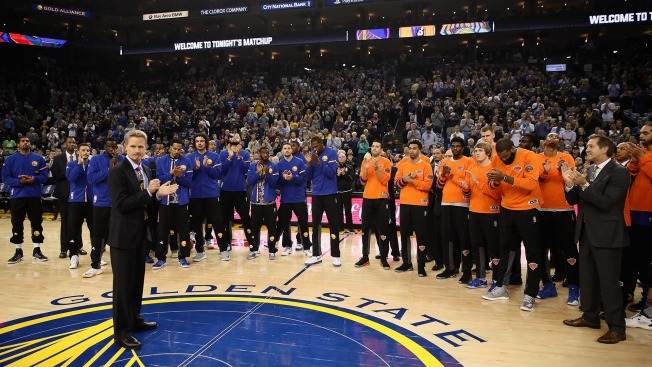 Between player introductions and the singing of the national anthem prior to the Warriors-Knicks game at Oracle Arena, Kerr took the microphone. He asked members of both teams to gather on each side of him at center court. Kerr said a few words about his friend Sager and requested that everyone participate in "a moment of joy." And for about 30 seconds, the crowd on its feet, there was sustained applause. It was different, yes, and so undoubtedly right. For Sager was more than a reporter wearing blazers finger-splashed with colors indiscriminately lifted from 123 buckets of paint. He was more than the guy holding the mic during TV timeouts and more than a buddy to all he met. Sager blazed a singular trail to become the best ambassador-mascot the NBA – or any other sports league – ever could have dreamed on its happiest and most imaginative day. He was Santa Claus to players and coaches and, over time, became that to fans who viewed him as one of them but also as someone whose human touch was more deft than most. Sager’s presence brightened the arena and everybody in it, from the ushers concessionaires to the owners and superstar players. Then, too, some of the suits Sager wore would make Santa’s outfit look like a middle-school uniform. So when Sager died at 65 on Thursday morning, after an absurdly brutal war with the demon that is cancer, the NBA lost its best friend and most fervent and beloved cheerleader. “Today’s a tough day for everybody who knew Craig – and probably even for those who didn’t, who just watched him and enjoyed his work over the last 30-plus years,” Kerr said earlier, his voice catching during his pregame news conference. Sager’s death prompted an avalanche of tweets and messages from around the league, literally hundreds of individuals expressing their grief over his loss and support for his family. Michael Jordan referred to Sager as a “legend” and a “friend.” Kobe Bryant tweeted about being “so grateful for the time” Sager shared with us. Bucks coach Jason Kidd posted a photo in which, as a player, he was being interviewed by Sager. JaVale McGee, who never had the pleasure of being interviewed by Sager, still weighed in to say he wishes he had shared a few moments. Of all those employed by the Warriors, no one knew Sager better than Kerr, a former colleague at TNT. “We worked together for eight years . . . a lot of fun games, a lot of fun nights on the road,” Kerr said. “Although with Sages, you only saw him for more than about 15 minutes on the road because he had to move on to the next bar or restaurant to see the next group of people. To say that I knew Craig well would be an exaggeration. Never shared drinks or a postgame meal with him. Nothing more conversation here and there, a walk down a hallway in San Antonio, a pregame meal in Houston, a few chats in the bowels of Oracle Arena. That and the relentless testimonials from those who knew him well was more than enough for me to conclude years ago, long before he was in the grasp of illness, that Sager was what he appeared to be. So when Kerr, standing on the court at Oracle, said the NBA has “lost a big part of its soul,” he could not have more accurate. Rest in peace, Craig Sager. And joy, too.